Our thoughts are with the family of John McKay (Henry John McKay) who passed away last night after a lengthy battle with cancer. John was a Victorian champion snooker player, and an administrator and organiser of cue sports in Victoria. He played a key role in the development of opportunities for many junior players, including Neil and his brother Marc. John was a legend of the sport on and off the table, and will be dearly missed. Neil was defeated 6-4 by Mark Selby. Neil defeated Barry Hawins 6-2 to advance to the Quarter Finals. Neil defeated Tom Ford 6-1 to advance to the Last 16, with breaks of 129, 112, 74, 100, and 127. Neil defeated Sam Craigie 4-0 and Joe Swail 4-2 to advance to the Last 32. Neil was defeated 5-4 by Judd Trump. Neil defeated Marcus Campbell 4-2 and Ben Woollaston 4-2 to reach the Semi Final, where he was defeated by John Higgins 4-2. Neil defeated Hans Blanckaert 4-2, Ryan Causton 4-1, and Anthony Hamilton 4-2 to reach the Last 16. Neil defeated Ding Junhui 4-2 to finish 2nd in his group and progress to the semi-finals of the Premier League. 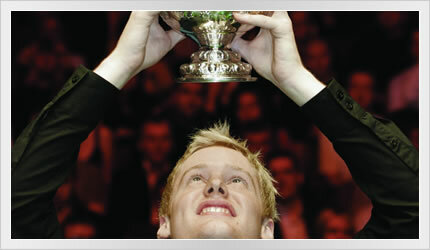 Neil was defeated 10-8 by Judd Trump, finishing Runner-Up in the inaugural International Championship. Neil defeated Shaun Murphy 9-5 to reach his first ranking final in China. Neil defeated Lu Haotian 6-2 to advance to the Semi Finals. Neil defeated Matthew Stevens 6-2 to advance to the Quarter Finals. Neil defeated Ryan Day 6-3 to advance to the Last 16. Neil was defeated 6-0 by Stuart Bingham. Neil defeated Alfie Burden 4-3 but was then defeated 4-3 by Andrew Pagett in the Quarter Final. Neil defeated Joe Steele 4-0, Daniel Wells 4-2, and Kurt Maflin 4-3 to advance to the Last 16. Neil defeated Jamie Burnett 4-3 to win ET2 in Gdynia, Poland. Neil defeated Tian Pengfei 4-0 and Stephen Maguire 4-2 to reach the Final of ET2. Neil defeated Martin Gould 4-3 to advance to the Quarter Finals. Neil came from 3-1 down to defeat Jamie Jones 4-3 and advance to the Last 16. Neil defeated Shaun Murphy 4-2. Neil was defeated 5-0 by Joe Perry in the Last 16. Neil defeated Chen Feilong 5-2 to advance to the Last 16. Neil defeated Ricky Walden 7-6 in the final. Neil defeated Michael Leslie 4-2 before losing 4-0 to Stuart Bingham. Neil defeated Mark Selby 5-1. Neil defeated Daniel Wells 4-1 before losing 4-1 to Barry Hawkins in Round 2 of ET1. Neil defeated Alex Taubman 4-0 and Yu Delu 4-3 to advance to the Last 32, which will be played in Poland in October. Neil defeated Jamie Rhys Clarke 4-0 and David Gilbert 4-0 before losing 4-0 to Martin Gould in Round 3 of PTC2. Neil was defeated 5-1 by Mark Davis in the Last 16. Neil defeated Nigel Bond 5-1 to advance to the Last 16, with breaks of 135, 81, 92, 113, and 93. Post match interview. Neil was defeated 5-1 by Jamie Burnett. Sydney-siders joined Neil at the MOTHER Fuelled Backyard Pool Challenge on May 10th and 11th outside Customs House at Circular Quay in Sydney, Australia. After trailing Ronnie O'Sullivan 7-5 at the end of the second session, Neil was defeated 13-10 in the third session. At the end of the first of three sessions Neil leads Ronnie O'Sullivan 5-3. Neil defeated David Gilbert 13-9 to advance to the Quarter Finals. At the end of the second session Neil leads David Gilbert 10-6. At the end of the first of three sessions Neil leads David Gilbert 5-3. Neil defeated Ken Doherty 10-4 to advance to the Last 16. Neil compiled 3 centuries in a row to end the first session ahead 7-2. Neil was defeated 5-3 by Peter Ebdon. Neil defeated Stephen Hendry 5-3 to advance to the Quarter Finals. Neil defeated Jamie Cope 5-4 to advance to the Last 16. Neil was defeated 4-0 by Stephen Lee. Neil defeated Stephen Maguire 4-0 to advance to the Final. Neil defeated Joe Perry 4-1 to advance to the Semi Finals. Neil defeated Jack Lisowski 4-1 to advance to the Quarter Finals. Neil was defeated 5-2 by Stephen Lee in the Last 16. Neil defeated Stephen Hendry 5-3 to advance to the Last 16. Neil was defeated 4-1 by Stephen Hendry in Round 1 (Last 32). IMG, World Snooker, and the Victorian State Government have announced the Australian Goldfields Open will return to Bendigo on the 9th of July. Neil was defeated 5-1 by Matthew Stevens in Round 2 (Last 16). Neil defeated Marcus Campbell 5-2 to advance to the Last 16. Neil finished 3rd on the league table of 7 players and went on to win Championship League Group 3 to qualify for the Championship League Winners Group in March. Neil defeated Shaun Murphy 10-6 to claim his first Masters title, and maintain his perfect record of 9 victories from 9 televised finals appearances. Neil defeated Judd Trump 6-3 to advance to the Final of the Masters for the first time. Neil defeated Mark Williams 6-4 to advance to the Semi Finals of the Masters for the first time. Condolences to friends & family of Bill Hart who passed away yesterday aged 81. Most recently the Secretary at Rooty Hill RSL, Bill was a pillar of the snooker and billiards community in Australia for more than 40 years as a player, referee coordinator, tournament director, and organiser. Bill was also one of Australia's most qualified referees. Neil defeated Mark Allen 6-3 to advance to the Quarter Finals. Neil was defeated by Mark Williams 3-2 and Stuart Bingham 3-0, before defeating Matthew Stevens 3-2, Shaun Murphy 3-2, and Mark Davis 3-2 to reach the Semi Final stage, during which he lost to Mark Selby 3-1. New wallpapers have been added to the Gallery page. Neil was defeated 4-1 by Dominic Dale. Neil was defeated 9-7 by Judd Trump. Neil defeated Ding Junhui 6-2 to advance to the Semi Finals of this event for the first time. Neil defeated Graeme Dott 6-3 to advance to the Quarter Finals. Neil defeated Tom Ford 6-1 to advance to Round 2. Neil was defeated 4-3 by John Higgins. Neil defeated William Lemons 4-0, Mark Allen 4-2, and Gerard Greene 4-1 to reach the Last 16. Neil defeated Stephen Lee 271-125 to reach the Semi Finals, but was defeated 519-157 by Ronnie O'Sullivan. Neil defeated Stephen Macguire 238-174 to reach the Quarter Finals. Neil defeated Michael White 4-1 to reach the Quarter Finals, where he was defeated 4-1 by Ronnie O'Sullivan. Neil defeated Mario Wehrmann 4-0, Cao Yupeng 4-2, and Kurt Maflin 4-3 to reach the Last 16 in Antwerp. Neil was defeated by Ding Junhui 3-2 in their semi final. Neil defeated Mark Allen 4-3 and Judd Trump 4-1 to claim his second PTC title of the season. Neil defeated Martin Gould 4-0, and Ben Woollaston 4-0 to advance to the Semi Finals. Neil defeated Gary Wilson 4-1, Tony Drago 4-1, and Joe Jogia 4-0 to advance to the Last 16 at PTC8. Neil defeated Shaun Murphy 3-1 in his semi-final but was defeated 3-1 by Judd Trump in the final. Neil was defeated 4-1 by Anthony Hamilton. Neil defeated Stephen Lee 4-0 in the semi-final and then defeated Ricky Walden 4-1 in the final to claim his first PTC title, jump to the top of the PTC Order of Merit, and climb to #4 on the official world rankings at the October revision. Neil defeated Stephen Macguire 4-3 to advance to the Quarter Finals, and then defeated Shaun Murphy 4-3 to reach the Semi Finals. Neil defeated Daniel Wells 4-2, Gerard Greene 4-3 and Peter Ebdon 4-3 to advance to the Last 16 of PTC6. Neil defeated Li Yan 4-3 to reach the Quarter Finals but was defeated 4-1 by John Higgins. Neil defeated Eden Sharav 4-0, Aditya Mehta 4-3, and Scott Mackenzie 4-2 to advance to the Last 16 of PTC5. Neil defeated John Higgins 3-0 and Ding Junhui 3-1 to win tonight's Premier league session including the evening's high break of 140. Neil was defeated 6-5 by world #1 Mark Williams. Neil defeated reigning world champion John Higgins 5-2 to advance to the Semi Finals. Neil defeated Michael Holt 5-2 to advance to his first ever Quarter Final in China. Neil defeated Liang Wenbo 5-1 to advance to the Last 16. Neil defeated Mark Joyce 4-2 and Passakorn Suwannawat 4-1 to advance to the Semi Finals, where he was defeated by Mark Davis 4-2. Neil defeated Chris Norbury 4-0, David Hogan 4-2, and Peter Lines 4-1 to advance to the Last 16 of PTC4. Neil defeated Scott Mackenzie 4-1 and Ali Carter 4-3, before losing to Joe Jogia 4-2 in the Last 32. Neil was defeated 3-0 by Matthew Stevens. Neil was defeated 4-3 by Judd Trump in the last 16. Neil defeated Chen Zhe 4-1, John Whitty 4-1 and Anthony McGill 4-0 to advance to the Last 16. Neil was defeated 5-4 and by just 1 point by Dominic Dale in the Last 16. Neil defeated Nigel Bond 5-2 to advance to the Last 16 at the inaugural Australian Goldfields Open. Australia was defeated 2-4 by Wales (Mark Williams & Matthew Stevens) in the Quarter Finals of the World Cup. Australia defeated United Arab Emirates 4-1 to guarantee their progression to the Quarter Finals. Australia was defeated by China 2-3. The Australian team (Neil Robertson & Steve Mifsud) defeated Thailand1 by 4-1 in their opening match of the group stages of the World Cup in Bangkok. World Snooker have announced that a new major ranking event the "Australian Goldfields Open" will be held in Bendigo, Victoria (Australia) for the next 3 years. Trump, Matthew Stevens and Jimmy White in a new 10 man format. Neil was defeated by Judd Trump 8-10. At the end of their first session, Neil trails Judd Trump 4-5. Play resumes 7pm UK time. Neil was defeated 5-1 by Peter Ebdon. Neil will join John Higgins, Stephen Hendry, Mark Allen, Peter Ebdon, Ali Carter, Graeme Dott, Jamie Cope, Ricky Walden and Ding Junhui at an invitational tournament in Hainan, China, from March 10-13. More info. Neil was defeated 4-1 by Grame Dott in the Last 16. Neil won 4 frames in a row from 2-0 down to defeat Nigel Bond 4-2, and advance to the Last 16 where he meets Graeme Dott. Click here to view Neil's 130 break in frame 5. Today we've added to the Gallery page a new series of desktop and mobile phone wallpapers, from Neil's shoot with leading Australian photographer Andrew Maccoll. Neil was defeated 5-4 by Anthony Hamilton in the first round of the German Masters. Neil defeated Ken Doherty 63-13 to reach the Quarter Finals, where he was defeated 57-49 by Marcus Campbell. Neil defeated Barry Pinches 106-15 to advance to the Last 32. He then defeated Alan McManus 50-49 to advance to the Last 16. With just over a minute remaining Neil trailed 13-49, but he managed to close the gap and pot his final black to make a break of 37 and win by 1 point with just 1 second to spare. Neil was defeated 6-4 by Mark Allen in the quarter finals of The Masters. Neil defeated Stephen Hendry 6-3 to advance to the quarter finals of The Masters where he'll meet Mark Allen. Neil was defeated by Shaun Murphy 9-7 in the quarter finals of the UK Championship. Neil defeated Andrew Higginson 9-5, and will now play either Shaun Murphy or Ryan Day in the quarter finals of the UK Championship. Neil is through to the last 16 in the UK Championship with a 9-1 defeat of Rory McLeod. Neil's next match is against Andrew Higginson. Neil was defeated in the Semi-Finals 5-1 by Ronnie O'Sullivan. Neil defeated Shuan Murphy 4-2 to advance to the play-offs in the Premier League. Neil's next match will be against Ronnie O'Sullivan on November 27. Neil was defeated by Marco Fu 4-2. Neil defeated David Morris 4-1 in Round 1, but was defeated 4-2 by Lui Song in Round 2. Neil defeated Rod Lawler 4-3 in Round 1, advanced through Round 2 after Matthew Stevens withdrew at 1-0 due to an injury, but was defeated 4-1 in Round 3 by Liang Wenbo. Neil defeated Rod Lawler 4-1 and Stuart Carrington 4-1 to advance to Round 4 of PTC6, but was defeated 4-1 by Dominic Dale. Neil match versus Mark Williams resulted in a draw (3-3). Neil defeated Mark King, Andy Hicks, and Graeme Dott to advance to Round 6 of PTC5, but was defeated 4-2 by Andrew Higginson. Neil defeated Barry Pinches 4-1 in Round 3 of EPTC2 in Belgium, but was defeated 4-2 by Jimmy White in Round 4. Neil was defeated 4-2 by Mark Selby. The world rankings update following the World Open has elevated Neil to world #1. Neil joins an elite group as only 7 other professionals have held this position since world rankings began in 1976: Ray Reardon, Cliff Thorburn, Steve Davis, Stephen Hendry, John Higgins, Mark Williams, and Ronnie O'Sullivan. Neil defeated Ronnie O'Sullivan 5-1 to maintain his perfect record of 6 victories from 6 finals appearances, his 6th world ranking title in 5 years, and has now won this event 3 times in 5 years. Neil came from 2-0 down to defeat Mark Williams 3-2 in their semi final, and now meets Ronnie O'Sullivan in the final. 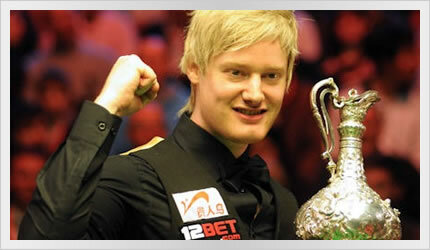 Neil defeated Ricky Walden 3-1 to reach the semi-finals of the World Open. Neil will now play Mark Williams for a place in the final. Neil defeated Andrew Higginson 3-2 in the Last 16 of the World Open, and will now meet Ricky Walden in the Quarter Final. Neil defeated David Morris 3-1 in the Last 32 of the World Open, and will now meet either Marco Fu or Andrew Higginson in the Last 16. Neil defeated Graeme Dott 3-1 in the Last 64 of the World Open. Neil was defeated by Peter Ebdon 5-4 in the Last 32. Neil defeated Andy Hicks 4-0 in Round 1, defeated Martin Gould 4-1 in the Last 64, but was defeated by Stuart Bingham 4-0 in the Last 32. Neil was defeated by Daniel Wells 4-3 in the Last 128. Neil defeated Allan Taylor 4-0 in the Last 128, but was defeated by Dominic Dale 4-2 in the Last 64. 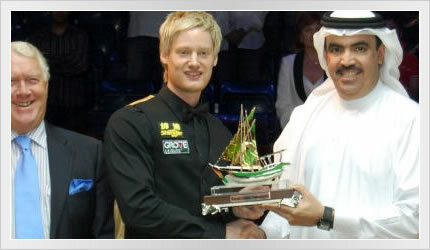 Neil finished Runner-Up in the Austrian Snooker Open, defeated 6-4 in the final by Judd Trump. Neil and his partner welcome into the world their first child, Alexander. Neil defeated Graeme Dott 18-13 to claim his first world title, and extend his record to 5 wins from 5 ranking event finals, with 1 victory in each of the last 5 calendar years. After their first session Neil trailed Graeme Dott by 5-3, but at the end of the second session Neil leads by 9-7. Play resumes 3pm Monday (UK time). FOXTEL will broadcast the third and fourth sessions LIVE in Australia, so if you don't have it at home, find yourself a venue and help us cheer Neil across the line to become Australia's first snooker world champion. 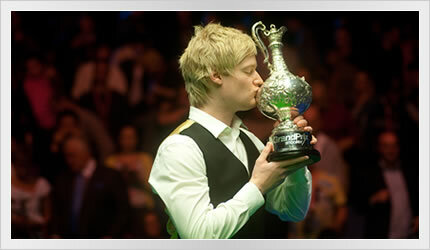 Neil defeated Ali Carter 17-12 to advance to his first world title final. Neil leads Ali Carter 15-9 at the end of their third session. Their fourth and final session starts at 2.30pm Saturday (UK time). Neil leads Ali Carter 10-6 at the end of their second session. Match resumes 7pm Friday (UK time). Neil leads Ali Carter 6-2 at the end of their first of four sessions. Match resumes 10am Friday (UK time). Neil defeated Steve Davis 13-5 to reach his second world championship semi-final in a row. At the end of the first session of his Quarter Final, Neil led Steve Davis 7-1, and at the end of the second session Neil leads 12-4. Neil defeated Martin Gould 13-12 to advance to a Quarter Final encounter with Steve Davis. Martin won the first 6 frames of their match and the first session ended with Neil trailing 2-6. Martin extended his lead through the second session, which ended with Neil trailing 5-11. Neil won the first 5 frames of the third session to close the gap to 10-11, before Martin won the 22nd frame to achieve 10-12, just one frame from victory. But Neil won the next 3 frames to complete a stunning comeback, winning a total of 8 of the 9 frames played in the final session. Neil's Quarter Final against Steve Davis commences 10am Tuesday 27th (UK time). Neil defeated Fergal O'Brien 10-5 to advance to the Last 16. At 69 minutes, the 13th frame was the joint third longest in Crucible history. Neil leads Fergal O'Brien 6-3 at the conclusion of their first session. Play resumes 2.30pm Wednesday 21st (UK time). The third frame featured a deep screw blue described by the commentators as the shot of the tournament. Neil was defeated 5-1 by Peter Ebdon in the Last 16 of the China Open, however he did achieve a personal milestone by compiling his first maximum break (147) in a professional tournament. 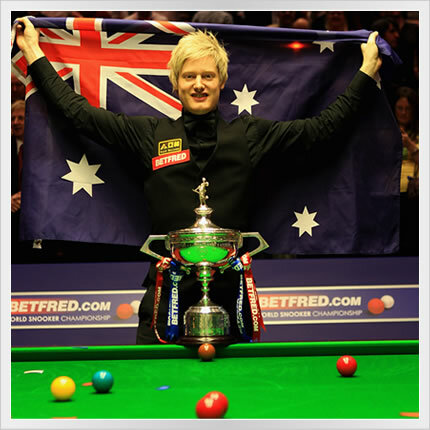 Neil becomes the first Australian to join the exclusive "147 Club". Video of Neil's 147: Part 1, Part 2, Part 3 and post-match interview. Neil defeated Mike Dunn 5-2, with breaks of 112, 88 and 102, to advance to the Last 16 where he will face either Peter Ebdon or Judd Trump. Neil was defeated 5-2 by current title-holder Ali Carter. Neil defeated Liu Song 5-2 to advance to the Last 16. Neil was defeated 6-4 by Ronnie O'Sullivan. Neil trails reigning world champion John Higgins 5 frames to 3, at the end of their first session in the Last 16. Neil won all 4 frames of his second session with breaks of 64, 53, 87, and 119 to defeat Tom Ford 9-3 and advance to the Last 16. Neil concluded the first session of his 5th round match against Tom Ford ahead 5-3, including breaks of 100 and 137. Neil was defeated 2-4 by Shaun Murphy. Neil defeated Marco Fu 4-2. Neil was defeated by John Higgins 4-2. Neil defeated Ding Junhui 9-4 to claim his second Grand Prix title and his 4th professional ranking title from 4 finals appearances. In the final he also passed another milestone, compiling his 100th century in ranking events. Neil compiled 3 centuries on his way to a 6-5 semi final victory against John Higgins, which was decided on the black and featured extremely high quality snooker from both players. Neil defeated Joe Perry 5-1 to advance to the Semi Finals of the Grand Prix. Neil wins his Last 16 encounter with Ken Doherty 5-2, to advance to the Quarter Finals of the Grand Prix. Neil has won his first round match against Gerard Greene 5-3. Neil's next match will be on Wednesday 7th October (random draw). Neil draws his match with Ronnie O'Sullivan 3-3. Neil was defeated 5-1 by Stephen Hendry in their week 3 Premier League match. Neil has lost to Ken Doherty 4-5 in a close first round match of the Roewe Shangahi Masters. Neil wins his first match in the Premier League 4-2 against Judd Trump.